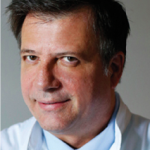 Christopher Tzermias and Leonardo Marini discuss the findings of their study on the use of photometry-guided PDT with methyl-aminolevulinate activated by blue and red light for moderate-to-severe acne. Acne vulgaris is the most common skin alteration among adolescents and young adults, affecting approximately 80–95% of the population1. Both genders experience variable degrees of acne at some point during their lives. Acne may occasionally be resistant to conventional medical-cosmetic treatments2–4. Besides conventional medical treatments, chemical peels and different energy sources, either alone or in sequential combinations, have been proposed with variable degrees of success. Energy sources, such as lasers (585–595 nm pulse dye laser, 800 nm diode, 532 nm KTP, and 1064 nm Nd:YAG), 515–950 nm intense pulsed polychromatic light (IPPL), 415 nm and 633 nm light emitting diodes (LED), as well as photodynamic therapy (PDT) with or without topical photosensitizers have been proposed. Light-based acne treatments usually achieve three main goals: reduction of intra-follicular concentrations of P. acnes, a decrease of biological sebaceous gland activity, and the decongestion of skin pores5–7. There is a need for new, safe, and effective alternative treatment strategies for patients affected by moderate-to-severe acne, who cannot or do not want to take oral medications, mainly isotretinoin. This particular group of patients is slowly increasing in number and may include women who are or want to become pregnant; individuals intolerant or allergic to acne-specific oral medications; and those affected by congenital or acquired pathological conditions, such as congenital or familial hyperlipidaemia and liver diseases. Conventional single-wavelength single-exposure (SW-SE) acne-PDT seems to negatively interfere with the biological activity of sebaceous glands despite the constant bio-stimulation of pilo-sebaceous units provided predominantly by androgens, which are the strongest driving force behind this skin condition4. More specifically, the photo-chemical reaction triggered by SW-SE acne-PDT can be used to selectively destroy intra-follicular P. acnes as well as photo-modulate sebaceous activity within affected anatomical areas. Sufficient concentrations of molecular oxygen within irradiated tissues throughout the full PDT process. To produce the best clinical effects, specific photosensitizers should be allowed to concentrate within affected target tissue, located within reach of selective light wavelengths. Presently, there is no universally accepted agreement on pro-drug concentrations, occlusive contact time (OCT), light wavelengths, and exposure times. Nevertheless, acne-PDT continues to produce significant clinical results irrespective of a standardization of treatment protocols. The authors are convinced that relatively short OCT (1–2 hours) may provide suitable concentrations of active porphyrins within selected tissue and that intra-cellular pro-drug conv ersion continues after a single irradiation of porphyrin-specific wavelengths. The choice of wavelength is not an easy decision to make since blue light (414–440 nm), even if better absorbed by MAL/5-ALA-derived PpIX, does not penetrate deep into the skin; while red light (633–690 nm), does penetrate deeper into skin layers but is not as well absorbed as blue light. For these reasons the authors decided to introduce a new treatment protocol based on three sequential irradiations starting with blue light as a superficial, efficient photo-bleacher, opening the way for two subsequent red light exposures with the purpose of optimizing skin penetration and final PDT efficiency. They arbitrarily selected an inter-irradiation ‘resting interval’ of 20 minutes to allow cells still involved in converting pro-drug into active photosensitizer to continue their job, re-accumulating PpIX within affected tissues. According to their protocol, they theoretically generate three subsequent PDT effects — one superficial and two deep — increasing the overall efficiency of PDT procedures. The authors’ clinical analysis has been based on a retrospective study aimed at evaluating efficacy, safety, and tolerability of the innovative sequential blue–red–red (SBRR) MAL-PDT protocol performed on a population of 39 patients during a period of 18 months. A population of 39 patients (56.4% males, 43.6% females), 15–44 years of age (mean 23.36), affected by moderate-to-severe acne vulgaris (AV), unwilling to take conventional oral medications were evaluated. Fitzpatrick phototype distribution showed 53.9% were stage II, 53.8% stage III, and 10.3% stage IV. Facial regions were the most affected anatomical sites (79.5%), followed by dorsal regions (15.4%), and chest (5.1%) (Table 1). After informing patients about the grade of severity of their skin condition, various treatment options were presented along with possible clinical results, complications, and side effects. Specific informed consent was obtained. 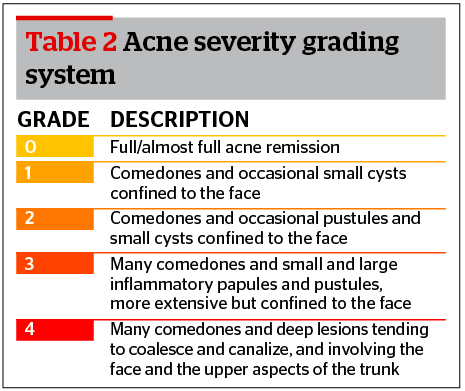 Acne severity was assessed according to the scale proposed by Pillsbury, Shelley, and Kligman (PSK scale), where ‘0’ represents full/almost full acne remission and ‘4’ identifies severe acne8 (Table 2). Acne severity for almost half of the patients (48.7%) was classified as grade 3 (moderate acne), and grade 4 (severe acne) for the remaining 51.3% before treatment (Table 1). The mean number of each type of lesion — papules, pustules, and cysts — was 9.54, 13.49, and 3.46, respectively (Table 3). Standardized clinical photographs were taken at baseline and 3 months after SBRR-MAL-PDT procedures. 16 minute red LED exposure (dose 100.8 J/cm2). To increase patient tolerability during LED irradiations, a non-contact skin cooling device (Cryo 5, Zimmer Elektromedizin, Germany) was used, directing the airflow almost tangentially to the skin surface in order to limit the reactive vasoconstriction and, therefore, tissue oxygen supply. A third superficial skin fluorescence (SSF-3) measurement was taken immediately after the last LED irradiation. At the end of each SBRR-MAL-PDT session, patients were asked to complete a simple questionnaire to assess pain level using the VAS scale (1 = no pain, 10 = extreme pain) during and 24 hours after PDT treatment. Adverse events, social activity limitations, and clinical effectiveness on acne lesions were also assessed. Patients were asked to select adverse events from a standardized list containing the most commonly observed after PDT procedures such as erythema, dryness, and itching. They were also given the opportunity to add symptoms and alterations not included in the list. Questionnaires were collected 30 days after the final SBRR-MAL-PDT procedure. 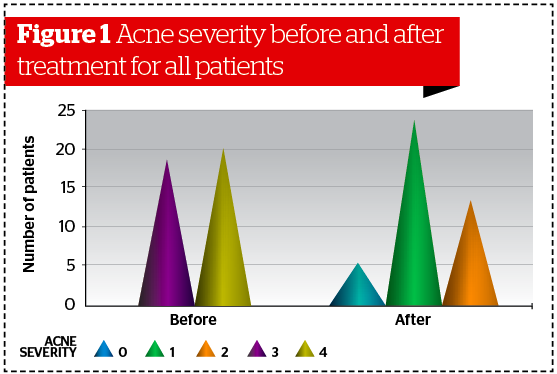 All patients saw a significant improvement with their acne after either one or two SBRR-MAL-PDT sessions. Occasionally a third session was necessary to consolidate and stabilize acne symptoms. How significant was the decrease in acne severity after the application of the SBRR-MAL-PDT protocol? How important was the monitoring of superficial skin fluorescence (SSF) before, immediately after OCT, and conclusively, after the full SBRR-MAL-PDT sequence? Acne severity was assessed at baseline and 1 month after each SBRR-MAL-PDT procedure. A chi-square test was used since variables were considered categorical. Acne severity was evaluated by considering the study population as a whole (39 patients) and dividing patients into two sub-groups: patients with facial acne, and those with acne confined to chest and/or dorsal regions. 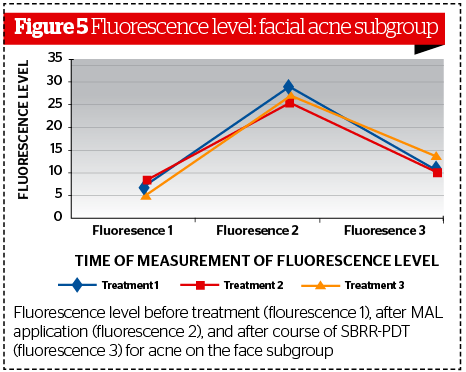 Superficial skin fluorescence (SSF) was statistically assessed comparing three different sequential measurements: baseline (SSF-1), immediately after OCT (SFF-2), and immediately after the full course of SBRR-PDT. Acne severity was significantly reduced after SBRR-MAL-PDT, on all anatomical areas involved (Ν = 39; p<0.001). When the entire study population was considered, acne severity was graded as either moderate (PSK 3) or severe (PSK 4) before treatment; while after SBRR-MAL-PDT, it was graded as clear (PSK 0) in 14.6% of patients. 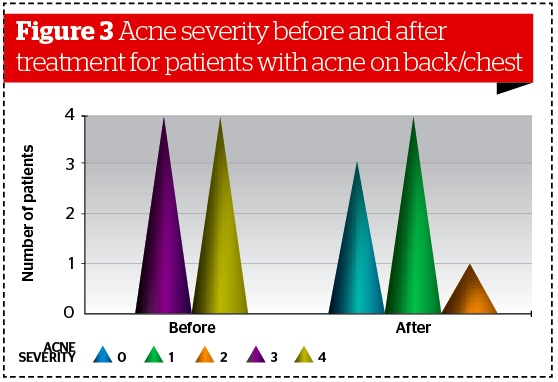 Almost one third of patients (31.7%) showed a stabilization on mild acne status (PSK 2), and more than half (53.7%) were classed as non-inflammatory acne (PSK 1) (Figure 1). Similar results were obtained analyzing data collected separately on patients affected by facial acne (Ν = 31, p<0.001) and patients affected by acne localized on the back/chest (Ν = 8, p<0.005). (Figures 2–3). Statistical analysis revealed no significant differences between male and female subgroups. 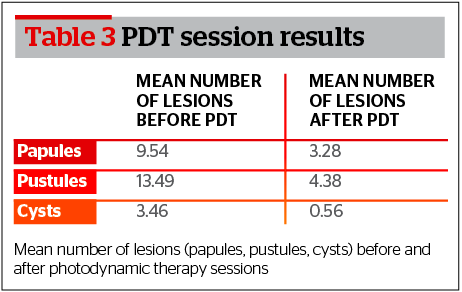 Furthermore, after completion of treatment at the time of assessment the mean for each type of lesion — papules, pustules, and cysts — was 3.28, 4.38, and 0.56 respectively (Table 3). Superficial skin fluorescence (SSF) was significantly increased 1-hour OCT (facial skin) and 2-hours OCT (chest/dorsal skin) after topical application of MAL in cream formulation. This analysis confirmed a sufficient localized accumulation of photosensitizer within affected tissues. 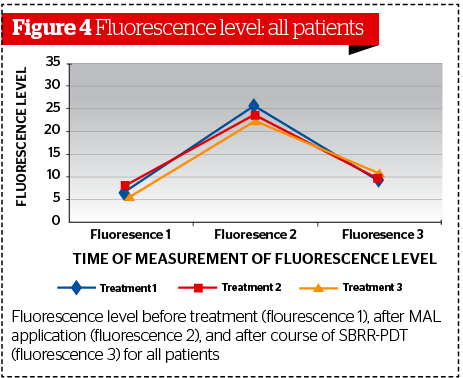 SSF measurement following SBRR-MAL-PDT photo-bleaching (SSF-3) showed a return to normal pre-treatment baseline values, confirming the PDT efficacy produced by the subsequent triple light exposure sequence. This trend was evident in the entire study population, both considered as a whole or subdivided into the two anatomical distribution sites. When the total number of participants was considered, the difference between initial skin fluorescence measurements (SSF-1) and those taken after topical MAL-OCT (SSF-2) was statistically significant, revealing higher SSF levels at SSF-2 compared to SFF-1 (p<0.001). Mean baseline SSF values were 7.07 FDU, while those measured after topical MAL-OCT, jumped to a mean of 25.68 FDU, an almost 4-fold increase to the baseline values. After completion of SBRR-MAL-PDT procedures, photo-bleaching was found to be almost complete, reaching a mean SSF level (SSF-3) of 9.15 FDU, almost as low as pre-treatment baseline values (SSF-1). The difference between SSF-2 FDU and SSF-3 FDU was statistically significant (p<0.001), demonstrating that selective tissue accumulations of photo-sensitizer (PpIX) have been almost completely consumed by SBRR-MAL-PDT (Figure 4). These measurements allow operators to have full control over all subsequent steps of PDT procedures, which can therefore no longer be considered as ‘blind’ as the operator will be aware of the effects of treatment. 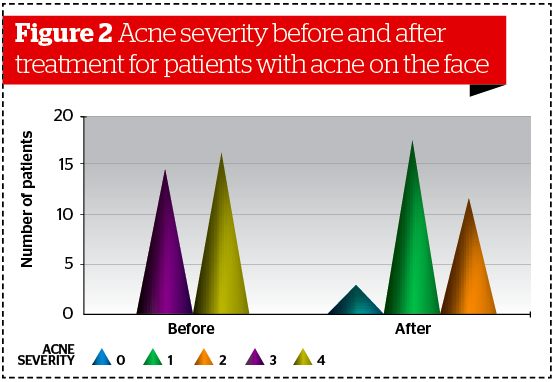 Data analysis for the facial acne subgroup confirmed the same trend, with SSF levels significantly higher at SSF‑2 (p<0.001) and significantly lower at SSF-3. (p<0.001 ) (Figure 5). Similar results were evident when the chest/dorsal skin subgroup was considered. Thirty out of a total patient population of 39 subjects completed the self-assessment questionnaire given to them to complete the study. Pain perception experienced by patients during active PDT treatment scored a mean of 5.71 (first session) and 5.57 (second session) on a printed 10 point VAS scale. Pain perception was reported lower during the 24 hours following PDT, scoring a mean of 3.87 after the first SBRR-MAL-PDT session, and a mean of 3.29 following the second session (Table 4). The main side-effect reported by patients after the first SBRR-MAL-PDT session was erythema (67.74%) followed by burning sensation (35.48%), dryness (32.26%), flaking (29.03%), itching (16.13%), oedema (16.13%), and temporary hyperpigmentation (9.68%). Patients who were exposed to a second SBRR-MAL-PDT session reported the same series of side-effects in the same order of importance (Table 5). It is worth noting that all side-effects/adverse events lasted no more than a few days following either one or two SBRR-MAL-PDT sessions. They all resolved spontaneously with simple topical skin care (gentle cleanser followed by spring thermal water and moisturizing creams). An average side-effect clearing time of 4.65 days was reported after the first SBRR-MAL-PDT session and 3.92 days after the second SBRR-MAL-PDT session. Almost half the study patients (48.4%) reported a voluntary withdrawal from common social activities after SBRR-MAL-PDT. Voluntary withdrawal lasted a maximum of 7 days. The majority or SBRR-MAL-PDT exposed patients reported a substantial satisfaction with the clinical improvement observed from their baseline acne condition (61.3%), while 22.6% expressed themselves as partially unsatisfied. It is worth noting that no patient from the partially unsatisfied group underwent a second SBRR-MAL-PDT session even if advised to do so. A small percentage of patients (16.1%) expressed themselves selecting a neutral position (Table 6). This retrospective single outpatient dermatological centre clinical study was carried out to investigate the effectiveness of a new multi-exposure PDT treatment protocol (SBRR-MAL-PDT) using a standardized concentration of MAL and a sequential series of LED irradiations with blue (415 nm, one exposure) and red light (633 nm, two exposures) to reduce and control the clinical manifestations associated with moderate-to-severe acne vulgaris. 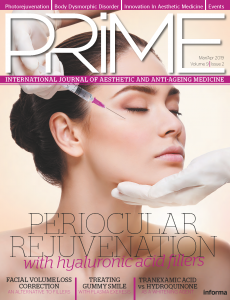 It is now known that when topical MAL is applied in a cream formulation to the skin, under occlusion, a selective accumulation of porphyrins (PpIX) has been noted, mainly within pilo-sebaceous units. Following the use of specific wavelengths of light, porphyrin activation ensues. Highly reactive oxygen species are generated within porphyrin concentration sites and cause reversible or irreversible cellular damage as described in all PDT procedures9. Molecular oxygen is the essential ‘fuel’ to support PDT reactions during light irradiation. Providing a constant supply for the generation of highly reactive oxygen species is essential to the overall efficacy of PDT procedures. Should O2 not be available in sufficient quantities to support PDT reactions during the whole duration of light irradiation, PDT effectiveness will inevitably be affected. MAL is not a photosensitizer by itself. 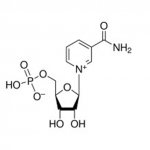 It represents a pro-drug7,10 that will eventually generate the active photosensitizer through a metabolic conversion within specific cells10–12. MAL is the methyl ester of 5-ALA and has been shown to penetrate more easily through the skin barrier, being relatively more selective in concentrating within pilo-sebaceous units13. Laser, IPPL, and LED sources can generate suitable wavelengths to be absorbed by porphyrins used in PDT procedures. Each light source can therefore produce an efficient PDT reaction within target tissues. LED sources have the advantage to cover relatively large areas with an almost uniform irradiation density. SW-SE acne-PDT has been widely performed, inducing significant improvements in clinical manifestations of acne vulgaris. Many studies have been published providing useful information about the effectiveness, tolerability, and side effects of different PDT strategies. MAL-PDT has been proven to be an effective treatment for inflammatory acne vulgaris even if occasionally associated with severe pain during irradiation and potentially significant post-treatment side-effects14. 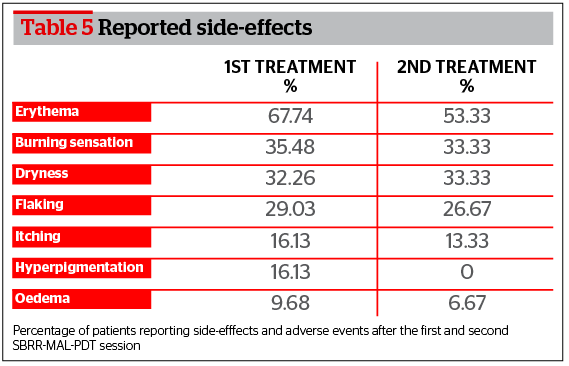 In a placebo-controlled randomised trial focusing on conventional (SW-SE) red light (635 nm)-MAL-PDT vs. red light (635 nm)-placebo-PDT to treat moderate-to-severe inflammatory facial acne vulgaris, both effectiveness and tolerability were evaluated. Thirty patients were enrolled in the study. Clinical results confirmed the effectiveness of SW-SE red light MAL-PDT in reducing the number of inflammatory lesions (mean reduction 54%) compared to placebo-PDT (mean reduction 20%) 12 weeks after PDT sessions. It was not a surprise to read that SW-SE red light MAL-PDT was related to more severe pain during treatments. Repeated treatments produced a relative reduction in pain levels15. In another recent double blind controlled clinical study on 36 patients, SW-SE red light (635 nm)-MAL-PDT was compared with red light (635 nm) irradiation alone in patients affected by mild-to-moderate facial acne vulgaris. A standardized concentration of MAL in a cream vehicle was applied on the whole facial skin. Occlusion contact time (OCT) was set at 90 minutes. A non-coherent red light (635 nm) was used as the irradiation source. The authors concluded that both treatment strategies were able to significantly reduce acne severity 10 weeks after each procedure. The SW-SE MAL-PDT group showed a relatively faster clinical response compared to the group exposed to red light alone. SW-SE MAL-PDT was associated with higher pain levels and post-treatment erythema compared to red light irradiation alone16. A consistent number of clinical studies have focused their attention on the comparative clinical effects between 5-ALA and MAL as PDT pro-drugs. In a split-face study on 15 patients with facial acne vulgaris, standard concentrations of MAL and 5-ALA were applied on opposite halves of the face. Although no statistically significant differences were found between the two photosensitizers in terms of effectiveness, 5-ALA-PDT led to more prolonged and serious post-treatment side‑effects, such as erythema and flaking. Patients evaluated pain as moderate-to-severe during light irradiation on both sides17. In another recent retrospective multicenter study performed in 20 Italian dermatologic clinics, SW-SE MAL‑PDT was evaluated for different clinical indications including acne vulgaris. The authors of the study demonstrated a consistent reduction (75%) in clinical manifestations of acne vulgaris in 72.8% of the study population17. According to the analysis of clinical data, acne severity was significantly decreased after the completion of proposed treatment sessions. This finding is consistent with most of the results published in studies discussed in other similar articles16, 17, 19. In addition to this, other studies of SW-SE MAL-PDT using red light have shown a reduction of inflammatory lesions of between 60 and 70% 3 months after the completion of treatment15,20. The results obtained in the present study confirmed the clinical efficacy of a new MAL-PDT protocol sequentially combining blue 415 nm LED (single 8 minute exposure) and red 633 nm LED (two 16 minute exposures) spaced by 20 minute ‘resting intervals’ (SBRR-MAL-PDT). 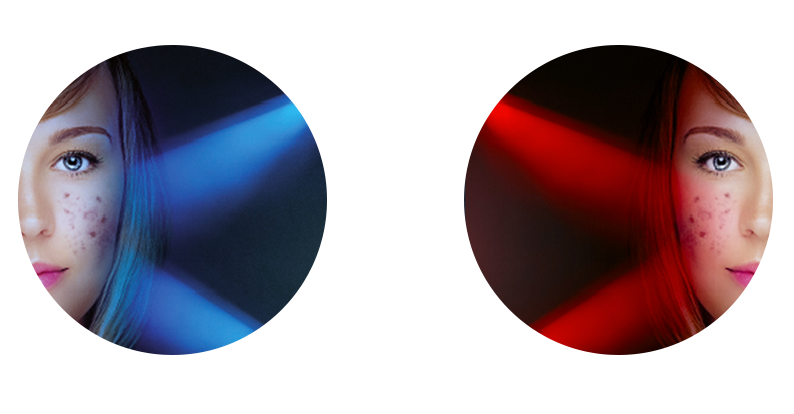 The two different LED wavelengths have already been confirmed by other studies to induce anti-bacterial (blue LED) and anti-inflammatory (red LED) actions19,21. The sequential irradiations of two different wavelengths allows a combination of ‘layered’ PDT effects due to the different trans-epidermal penetration depths specific for blue (750 μm) and red light (2000 μm). The blue LED exposure contributes to induce a superficial PDT effect, also effectively photo-bleaching the porphyrins accumulated within external skin layers. This primary PDT effect will therefore also allow for a more efficient penetration of the two subsequent red LED irradiations. Red LED will, therefore, be allowed to produce a deeper and more efficient PDT effect. The 20 minute resting intervals between each irradiation allows a ‘replenishing’ of O2 tissue reservoirs, absolutely necessary to generate efficient PDT effects on deeper skin layers. SBRR-MAL-PDT is not a pain-free procedure. The sequential triple irradiation series — one blue and two red LED — was perceived as painful by all patients enrolled in the study, even if pain levels stabilized little above level 5 on a 10-point VAS scale. Pain was more intense during LED irradiation and progressively faded once PDT reactions subsided. Patients who underwent a second SBRR-MAL-PDT session confirmed a relative reduction in pain level possibly due to a reduced number of inflammatory lesions and as a progressive ‘accustomisation’ to PDT treatments. Similar behaviour has been described in other clinical studies15. During SBRR-MAL-PDT a non-contact epidermal cooling device was used in order to minimise discomfort during LED irradiations, since pain associated with PDT represents an important patient-related limitation factor in PDT procedures22. So far the use of epidermal freezing or cooling devices is considered the best way to decrease and control pain induced by PDT procedures23. Side-effects perceived by patients were similar to those reported in other studies14 even if SBRR-MAL-PDT was associated with fewer profound, shorter duration, and self-resolving post-treatment alterations. Patient safety before discharging due to objectively perceived reduction of intra-tissue levels of photosensitizer. According to the authors’ results, this new therapeutic protocol seems to constitute a safe and effective alternative to oral medications, even in countries with plenty of sunshine. SBRR-MAL-PDT could be proposed as a valid alternative strategy to oral medications for patients affected by congenital hyperlipidaemia, neuropathy, hepatopathy, and psychotic/depressive disorders, as well as those with elevated alcohol consumption, blood donors, and all those involved in strenuous physical activities. Patients resistant to conventional acne therapies, with multiple antibiotic allergies/resistance, and all those who are unable or unwilling to take oral isotretinoin, as well as women who are planning a pregnancy, could all benefit from this innovative photo-chemical bio-modulative treatment strategy. Cost-effectiveness is of primary importance, particularly in times of global recession. Comparing costs related to oral isotretinoin treatments, inevitably associated with costly laboratory monitoring, possible management of side-effects, and potential complications with those of SBRR-MAL-PDT and other acne-PDT procedures, overall investments might be cheaper for PDT strategies, although more studies are necessary to establish long-term costs of PDT acne control strategies25. It is important to consider that achieving an effective and long lasting control of acne vulgaris associated with minimal side-effects, complications, and pain remains a difficult therapeutic challenge even if various alternatives exist to cover almost all clinical manifestations of this complex and widespread skin condition. Treatment strategies should be aimed not only at controlling the clinical manifestation of acne, decreasing the number of active lesions, but also preventing scaring26 while controlling anxiety, depression, and other psychological problems that might lead to a progressive modification of social interactions27. Overall, the protocol used in the present study could be characterised as slightly stronger compared to previous SW-SE protocols. The purpose of this was two‑fold; firstly to reduce inflammation within and around affected pilo-sebaceous units and to modify the surrounding tissue in order to prevent and/or reduce the chance of post-acne scarring activating MMPs and neocollagenesis; secondly, to reduce the size of residual sebaceous glands to achieve long-term control of inflammatory acne. Therefore, a stronger PDT result was necessary to achieve this effect. Furthermore, the present protocol is an elaboration of the original report by the PDT group working with Professor Martino Neumann (Erasmus University in Rotterdam), which demonstrated that fractionated light exposure works better than continuous exposure. The blue light contributes towards photo-bleaching the external skin layers, opening the way for red light to proceed deeply into the skin without major interferences, resulting in an optimisation of the clinical effect. Two red light passes 20 minutes apart create a double PDT boost due to the reperfusion and re-oxygenation of deeper tissues28–29. In conclusion, SBRR-MAL-PDT can be considered a safe and effective alternative treatment to control the clinical manifestations of moderate-to-severe acne vulgaris. This superficial skin fluorescence (SSF)-controlled PDT ensures a reliable objective assessment of photosensitizer concentrations within affected tissues before, during, and after PDT, significantly reducing post-treatment risks of unnecessary phototoxicity. 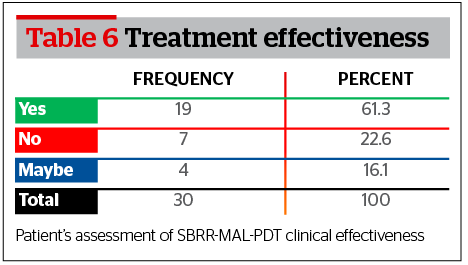 SBRR-MAL-PDT was well tolerated and few, low intensity, short-term side-effects have been observed. In common with other similar PDT studies, the authors’ have to admit that even if SSF-controlled SBRR-LED-PDT represents an innovation in the complex field of acne treatments, the protocol should be considered as a simply organized sequential PDT strategy thought to logically combine progressively penetrating wavelengths to ensure a more uniform, multi-layer tissue irradiation and therefore a better and more efficient PDT effect. 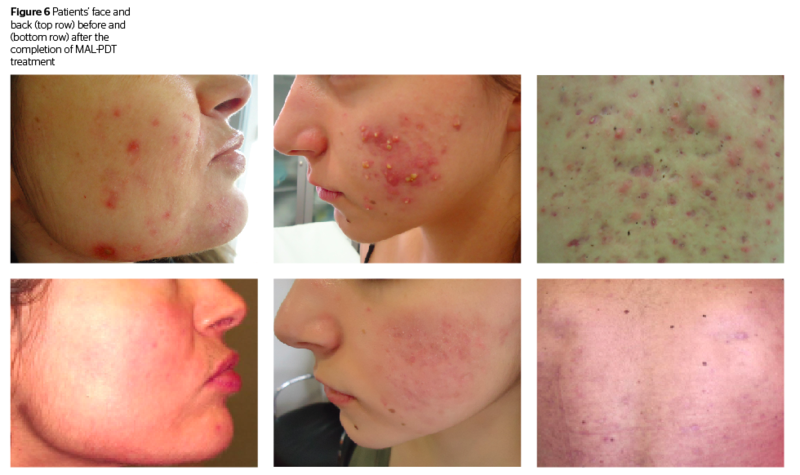 This is a preliminary study and a maintenance treatment schedule was not assessed even if, when acne remission was achieved, clinical control was effective up to 3 months after the last PDT session. SSF-controlled SBRR-LED-PDT could potentially be ‘exported’ to other fields of dermatologic applications, including treatment of non-melanoma skin cancer. Further studies will certainly be needed before a consensus protocol could be reached for both acne control and other dermatologic PDT applications. 24. Bjerring P, Christiansen K. Fluorescence-Guided Photodynamic Therapy. In: M.H. Gold (ed. ), Photodynamic Therapy in Dermatology. Springer: New York, 2011. 25. Zelickson BD. Mechanisms of action of topical aminolevulinic acid. In: Goldman MP, Eds. Photodynamic Therapy. 1st Ed. Philadelphia: Elsevier Saunders, 2005.